Stunning Penthouse Suite Offering Almost 1100 Sq.Ft. 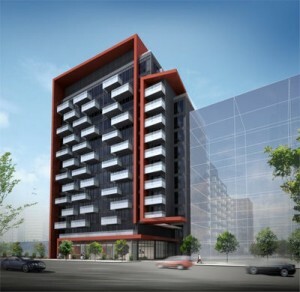 With 3 Enclosed Bedrooms (Or 2 Beds+Office)& 2 Washrooms.Brand New Tridel Reve Project. Laminate Throughout The Unit, Granite Countertops & Island, Dark Chocolate Cabinets, Large Windows, Efficient Floorplan= No Wasted Space. Lovely Master Bedroom With Ensuite. Walking Distance To Financial District,Union Station, Waterfront, & Trendy King West. Why Move To The Suburbs When You Can Have It All Downtown? Designed By Wallman Architects, Reve Brings A Unique Flair To The Portland Neighbourhood With Dramatic Red Accents And Unique Balcony Placement On The Front Facade. Modern Design At Its Best With Virtual Concierge & Stunning gym & Party Room. 3 bedrooms, 2 bathrooms, with 1 parking space and a locker.